SSA Gujarat BRC,URC,CRC Co-Ordinator Recruitment 2017 Online Apply Started. Aapanu Gujarat :: Official Website: SSA Gujarat BRC,URC,CRC Co-Ordinator Recruitment 2017 Online Apply Started. SSA Gujarat BRC,URC,CRC Co-Ordinator Recruitment 2017 Online Apply Started. SSA Gujarat BRC,URC,CRC Recruitment 2016 Online Apply Started. Sarv Shiksha Abhiyaan Mission Gujarat Has Published Notification For the Recruitmet of BRC,URC And CRC posts. 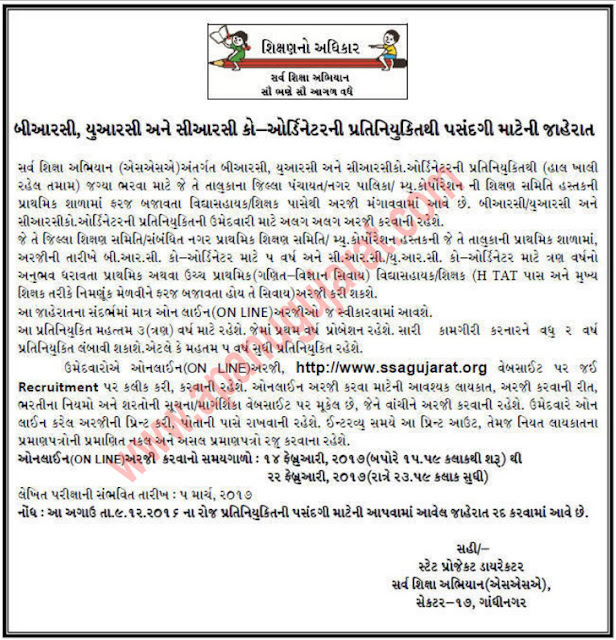 Eligible and Interested Teachers Can Apply Online for above said posts on official site e.g.;www.ssagujarat.org. Online application invited for these posts and it will open on 16 December 2016. More details for Recruitment are as given below. Qualifications : Candidates Must have Three years Experience As Primary/Upper Primary Teacher(without Math-science teacher) - HTAT Pass.